Sensors in Chicago street lights will record hyperlocal data. Chicago has some pretty decked out street lights already. 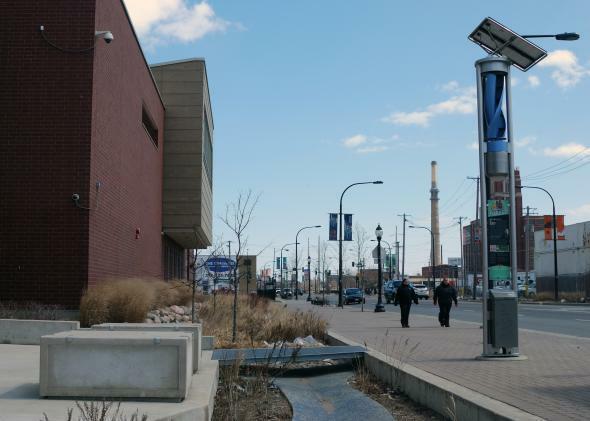 Here a street light with solar panels and a wind-powered generator from 2013. If Google Glass is too conspicuous for you, try something more subtle. How about loading street lights with sensors? In Chicago, decorative metal pieces on Michigan Avenue street lights are being fitted with sensors that will measure things like air quality and wind, while also counting passersby. The Chicago Tribune reports that starting in July, the hidden sensors will measure air quality, light intensity, sound volume, heat, precipitation, and wind. They will also use the wireless signals from cellphones and other mobile devices to count people going by. The University of Chicago and Argonne National Laboratory are collaborating on the project, which will hopefully provide really specific information about how bad pollution gets in specific parts of the city, or where the inefficiencies are in an intersection. If the program data are useful, the initiative may expand or become a permanent fixture. Things could get a little weird though. Will people who carry a smartphone and a tablet be labeled a public nuisance for skewing the pedestrian counts?